Yesterday Scott and I went out to start getting our memorial tattoos organised. 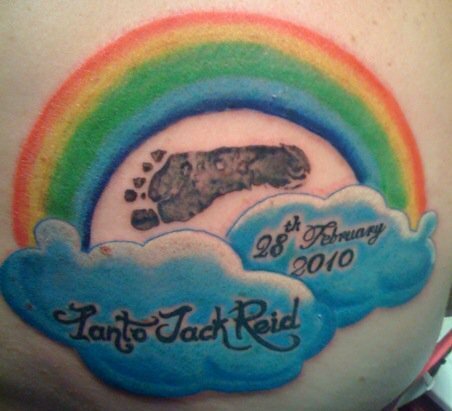 When we got there and started talking to the tattooist, he mentioned he'd had a cancellation that day and could do one of them then and there. After a few moments of "oh, no, I can't do it now!" I decided that I could do it. I sat in the chair, and... Ohhhhhh it hurt when the needles hit my skin. I've got two other tattoos, but this one is my biggest - and my first coloured one. The pain wasn't too bad after a while. I got used to it, sort of. All up, it took four hours, with five minute breaks every now and then. It actually hurt more the first ten minutes after coming off a break. At one point, I realised how bored I was - I'd gotten used to the pain so much I could hardly feel it anymore. At around the three-hour mark, it started getting really painful again, and it wasn't easing up. Shane (the tattoo artist) got up for another break, so I got up and looked around. There were some tattoo magazines nearby, so I started reading one. Turns out I should have done that to begin with - the last hour flew by. The only times I could properly feel it was when I was between magazines! So, finally... The finished product. It's still a bit red and swollen, and the colours still need to settle, but there it is. I think it's fantastic. Your tattoo looks awesome! What an incredible way to honour your precious Ianto.